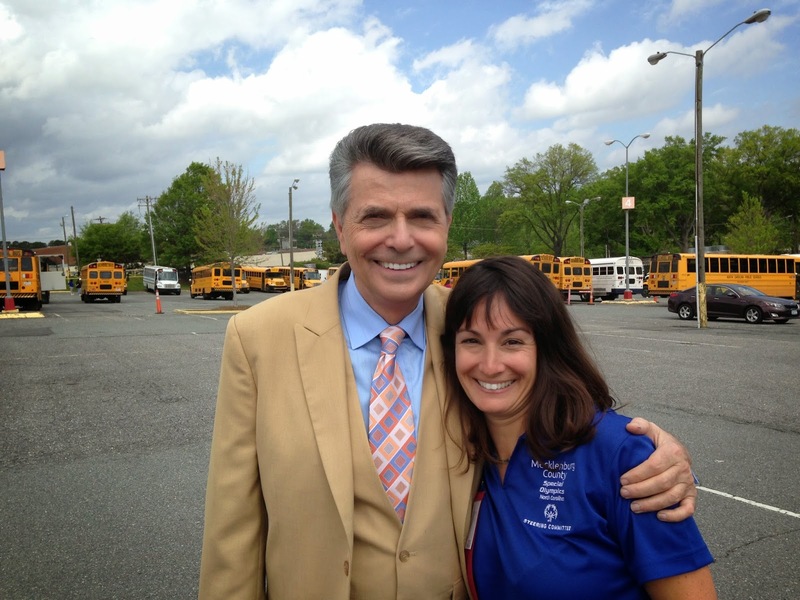 Larry Sprinkle is a local celebrity in Charlotte, North Carolina. He is the long time weatherman for NBC Charlotte Today. He also supports several organizations like Special Olympics, making him a popular man in this city. Mr. Sprinkle has been announcing for the Special Olympics Opening Ceremonies for many, many years. He does not let up on his enthusiasm on any of the over 100 schools. Ever. It is genuine and heartfelt. He does a truly amazing job of making each athlete feel special as they parade past the cheering crowds. After the opening ceremonies, I was heading to our car with my kids and friend, Tracy. Tracy noticed Larry Sprinkle walking by himself across the parking lot. I instantly said, "I want a photo with him." Tracy, who is never in need of extra prompting for spontaneity, told me he would take the photo. We sprinted across the lot and caught up with Mr. Sprinkle. Without a care in the world or even a "who is this crazy lady and her friend" look, he took a few photos with me. I thanked him for all that he does for Special Olympics. I thought I was the only one with love for Larry. Turned out I was wrong. At the Special Olympics meeting this week, I proudly announced that I had my photo taken with the big guy. Our director said, "So did half the teenage girls that were there in the choir." Probably exaggerating, right? No. The next day, I received 800 photos taken at the Special Olympics Opening Ceremonies. The photos below were within the file and are proof of Larry's adoring fans. Why fill the stands for Special Olympics?